This week in Year 3, we started reading a new book based on our topic of Egypt. It wasn’t a long book, about 15 pages in fact but I still wanted the children to be hooked in and to get enthused about what they were going to read (and be writing about). They didn’t know that we were going to be learning about Egypt until a few days later. So I started by visiting Tagxedo and typing the whole story into their create box. This took a little while, but like I said, it wasn’t a long book so it was fine. I then removed all appearances of the main characters’ names. I didn’t want them to know these just yet and thought we could introduce them later. Next, I gave them the chance to explore any unusual or unknown words and to make a list of them. They jotted them down and then we recapped how to use a dictionary (or find them on Google) and they went about writing definitions of the words that they didn’t know. We then had a bit of fun by spending 5 minutes telling each other the story, just based on those words. They found this HARD, but of course they did. They are 7 and were given a bunch of words and nothing else. The final step was the toughest one. I told them that every single one of them would probably get it wrong and that this was totally ok. We predicted the name of the book. 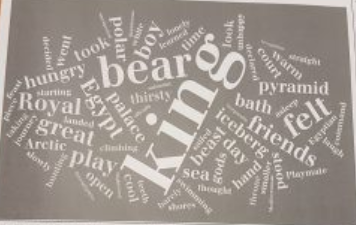 We had “The Royal Bear King” and other similar mixtures of the big words such as “King Bear and the Royal Pyramid”. But others used the clues a bit more. 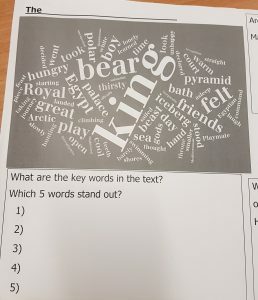 One girl said that as it said Arctic and Egypt, there was obviously some travelling involved so she chose “The King who went on his travels”. It was a good insight into their thinking and they were nearly all wrong. Yep, one got the title spot on. The book was the Egyptian Polar Bear. We have now started writing about the places that the polar bear visits on his travels from the Arctic to Egypt and using our descriptive techniques to describe his amazing journey. 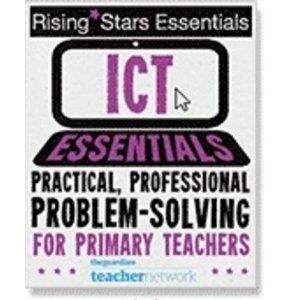 If I was doing this reading lesson again, I would make hieroglyphics a bit larger by typing it a couple more times as it was so small, most children didn’t see it or even try and look it up.